Summary: We have a fevered desire to know the future, especially about the dynamics that shape our lives. Giving us confident answers pays well, tempting even the best of professionals. Here we examine a case study: the La Nina related weather and bad harvests. Another in a series about food, one of the underappreciated drivers of geopolitical change. Recent posts have discussed three possible meteorological drivers of global cooling — and poor harvests. Eruptions of Kamchatka volcanoes — Certainly disruptive to global weather patterns; some cooling effect, but its magnitude is difficult to assess. Solar Cycle 24 (the 24th of the sun’s 11 year cycles for which we have good records) — Speculative. See posts here and here for details. ENSO (Pacific Ocean weather) swinging to La Nina-dominated cycles — The cooling effect is certain; duration unknown. Details are here, with an update below. Even the news media has woken up to the effects of the current La Nina. But how long will it last? It might be ending now. Or it might last for years, like the cooling during 1970-1976 (the global cooling scare; links to more information appear at the end). With food stockpiles dwindling, even one more year of bad harvests would have severe consequences. The good news is that meteorologists have powerful forecasting models. The bad news: their forecasts don’t agree. 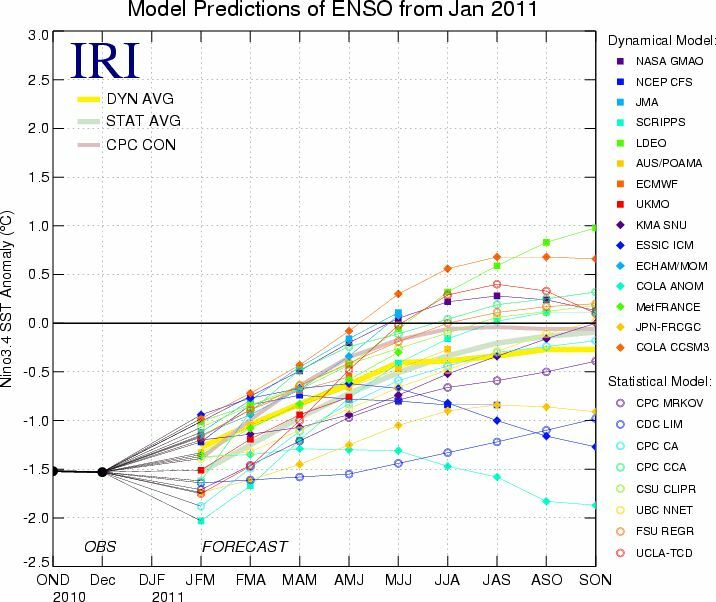 See this revealing graph from page 27 of NOAA’s weekly ENSO report, the go-to place for information about these cycles. NOAA tells us like it is. Next year we might have good harvests. In which case food prices probably remain high for a few years while stockpiles are rebuilt. We can see several possible drivers that might produce continued (or worse) bad weather, sending prices spiraling even higher (especially with stockpiles so depleted). Today’s best climate science models cannot accurately forecast a specific regional climate pattern ten months in advance. This puts the confident and scary forecasts for 2050 and 2100 in perspective. Climate science studies complex and poorly understood phenomena, things on the edge of the known. Dynamics of great importance to humanity. Many of their leading scientists have given into the natural impulse to grandstand, making big predictions beyond the state of the art. Time will tell who is correct. See all posts about food on the FM reference page Food – articles about this global crisis. Previous Post Update about the weather on the Sun. Perhaps coming soon to Earth, visible in your local supermarket.